Rinse lettuce, cut into separate whole leaves and set aside to drain. In a mixing bowl, combine all ingredients except chicken. Over medium heat, cook chicken in skillet stirring frequently to prevent burning. After 5 minutes, while chicken is cooking, gradually add in the combined ingredients from the mixing bowl. Cook until the meat is crumbled and brown. Remove from heat. 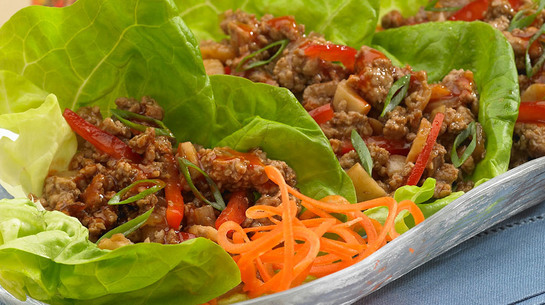 Spoon chicken mixture into center of lettuce leaves, place two to a plate and serve.